Mice are some determined little critters. They’ll climb ladders, scale walls, walk across wires, and even swim through sewers to make their way into your home. Just when you think you’ve taken all the precautions, you find a relentless little rodent hiding in your house. What could you possibly be doing to attract mice?! Check out these five things that are inviting these long-tailed pests into your home. Leaving food around is the most obvious cause of unwelcomed visitors. Even though you do your best to put away any food that’s laying on the counters, and wash up your dishes so they’re not out overnight, there’s one thing that many people don’t take into consideration – your cereals and oats. 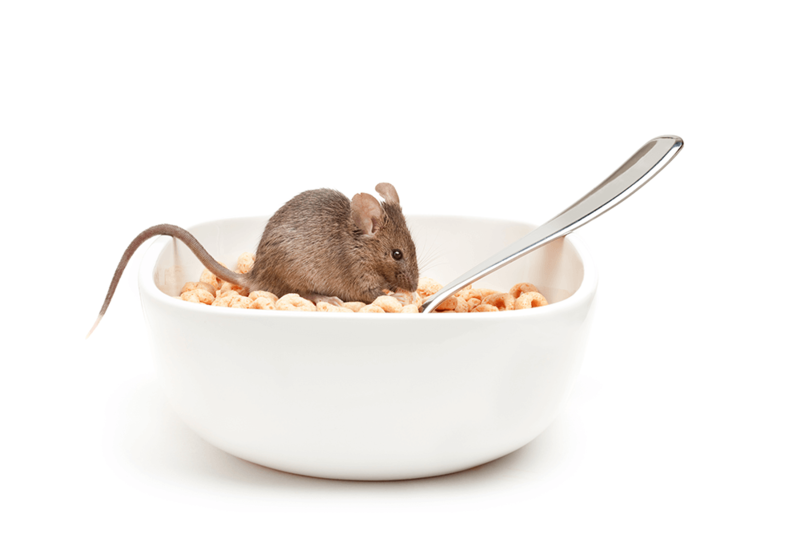 Mice survive on vegetarian diets, usually seed and oat centered, which means your oatmeal and Fruit Loops are fair game. If you don’t properly seal these foods, it’s like you’re holding up a flashing red ‘FOOD HERE’ sign for the mice. Try getting plastic containers to put your cereal and oats in. This way you know that they are sealed airtight and no unwelcomed guests will be feasting on an all-you-can-eat cereal buffet. We all do it – we let stuff pile up in our bedrooms without even noticing. Besides, it’s not really doing anyone any harm, right? The bad news is that pile of clothes you’re letting sit in the corner of your room is the perfect home for mice. Mice thrive in unkempt conditions, and a cluttered area is the perfect nesting location for their family. The last thing you want is for your bedroom to be the center of a mouse breeding ground. Maybe it’s time to throw out any old or unwanted clothes, and deep clean any areas in your home that are susceptible to collecting a build-up of clutter. Nothing yells, “welcome home!” like an open door. Remember, mice are very little creatures, so even leaving your door open a crack is like leaving it wide open to a mouse. It can be hard, especially when it’s warm out, to not keep your doors or windows cracked open. The more openings you have that can let unwanted guests in, the more likely you are to host a family of mice. If you really want to keep your doors or windows open, make sure they have thick screens in them to try and steer the mice away. We always make sure that we put away and seal our own food, but sometimes pet food slips past our minds. Pets often don’t finish all of their food, leaving some left over in their bowl. Leaving food sitting in their bowl is the same as if we were to leave a slice of pizza sitting on the counter. Make sure that any of the food your pet doesn’t finish is either thrown away or placed back into in a secure, air-tight container that mice won’t be able to break into. Mice are nostalgic critters. It’s kind of sweet, in a strange way. Familiarity is a major attractor for mice. They feel comfortable living in places where they know a former friend had stayed. It reassures them that it was a suitable living place and that their nest won’t be touched. If you had a previous mouse problem and didn’t properly sanitize after extracting the mice, then you’re still welcoming them in with open arms. Make sure that you remove all droppings, clean any grease marks from the baseboards, and sanitize the nesting areas completely. Even if you only see one mouse, that doesn’t mean you should shrug it off. A small problem can quickly multiply into a gigantic one if you’re not careful. If you’re ready to keep those pesky mice from nosing around your cheese, call us at 706-979-2536, or fill out this simple form. We’ll even come out for a free in-home inspection and give you a free quote on the treatment that’s best for you!